In our e-News, Tidings, we’ve been doing a series on newbie sailors and their new boats. Each season, we get a sailor or two who learns to sail with us and then goes on to buy a boat within a few years. 2015 was exceptional: three newbies bought their first boats the same season they learned! It’s not something we recommend generally, but you can decide for yourself if this is for you. We can help. Advise is free. Part III features Jason, who wasn’t one of the newbie sailors from 2015. He was a lifelong sailor. But he took our Coastal Nav (105) course last spring, is signed up for Bareboat 104, and wound up with a boat. So, here he is. 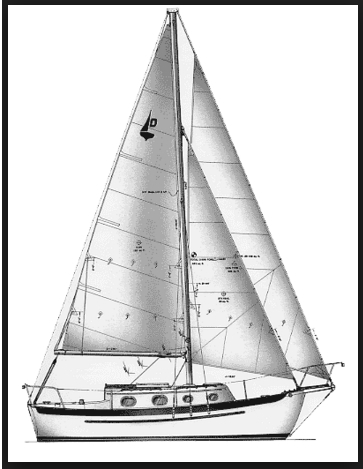 Schematic of the Pacific Seacraft Dana, the largest little 24-footer you’ll ever encounter. Q: What made you start thinking seriously about boat ownership? When? A: I have been thinking about boat ownership since my father took me on my first cruise when I was 13. The sailing bug hit me hard and I spent every summer on the water working for cruise companies and yacht clubs just to get aboard a boat to go sailing. It didn’t become a serious possibility until 3 years ago when I was finally debt-free and set saving for a boat as a 40th birthday present to myself as my next financial goal. I considered alternatives including joining a club and doing a timeshare like Sailtime. I decided that boat ownership was the way to go after being a member of a club and being frustrated that it was impossible to use the boats for cruising, difficult to arrange to take friends and being bound by policies and procedures that didn’t match the way that I like to sail. A sail timeshare didn’t offer many advantages other than having a little more flexibility in being able to cruise. I still didn’t have my choice of boat and to sail a lot was twice as much as the yearly payments that I’m making on my own boat. What did you envision doing with/on your new obsession? I am planning on spending the summer sailing, wandering up and down the east coast as time, tide and wind allows. I am lucky to have a lot of time off in the summer so I plan on being on my boat in some capacity from early May to late August. I will also be doing a lot of maintenance. I have never been on a boat very long before one system or another goes haywire so I also see many curses, frustrations, and a lot of time spent in uncomfortable positions in my future. When did you take the plunge, and what did you wind up adopting? I finally had enough saved up for a significant down payment just a few months ago. This was at about the same time that I realized that a smaller vessel was not only less expensive to purchase but less expensive to maintain, upgrade, dock, moor, and store. 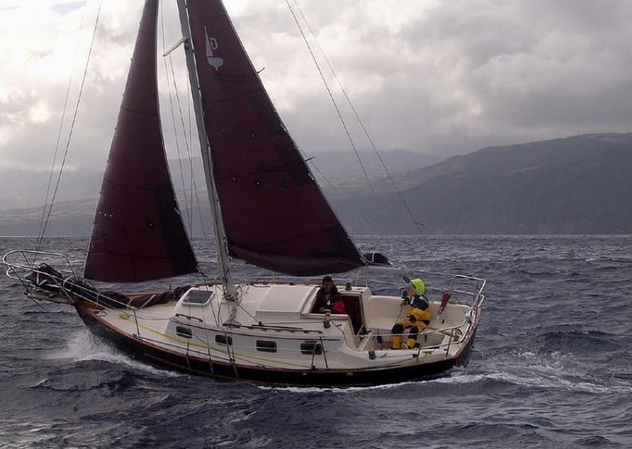 I had long admired the Pacific Seacraft 37 as the boat that had enough performance for casual day sailing but could one day satisfy my bluewater aspirations. I settled on another Crealock design, the Dana 24 because she is much shorter but still has the cruising chops of the 37. With the money I saved on the purchase and 13 fewer feet of slip space, I have more seed money in the cruising kitty and can treat her to the upgrades she deserves. How has that worked out for you so far? What have you managed to do? It has been great so far. She came fully equipped with only 150 hours on the engine so the only work that I have done has been cosmetic. I changed out all of the interior cushions that were original to the boat and painted the bottom. My next order of business is to get her shipped from Rhode Island where I bought her and bring her to New Jersey where I have a slip. What was the best experience you had so far? What was the worst? The best experience was definitely the sea trial since that has been the only time that I’ve had her on the water. She performed magnificently and I couldn’t believe that I was finally at the helm of my very own sailboat. The worst has been dealing with New Jersey to register her in the state. Fortunately, I am working with an amazing document company that is helping to guide me. Any changes to what you originally envisioned doing with her? If so, why? So far everything is happening according to plan. I’ve been thinking about this for a long time, done a lot of research and gotten a lot of advice from those who are more experienced than I. Winds and currents change and I’m sure there will be changes to my course but I hope to enjoy the journey as it comes. Any advice you’d offer up to others thinking of joining the ranks? Get help. Professionals will make the process better. I relied on everybody who was involved with the transaction and asked all of them for advice in their area of expertise. My broker was an incredible quarterback for the whole process. The surveyor had spent a life on the water cruising, racing and working in the merchant marine and offered great suggestions about upgrades and simple tips for maintenance and upgrades. The document company handled the financial transaction and registering the vessel with the Coast Guard and are still invaluable in helping me navigate all of the bureaucracy and paperwork involved with boat ownership. When people tell you to plan on spending some 20-30% of the boats purchase price on extra stuff, that might be conservative especially if you hire outside help. Whether you DIY or not, there’s still insurance, surveying, slip fees, materials, delivery and many other costs that just add up. This could be you! It’s not Jason – didn’t get a pic of his Dana by cyber press time… but his is further down on this post. If that sold you on getting your own boat, feel free to hit us up for some quick, casual advice. If that made you say, “no way,” then sign up for our Sailing Club by March 31 and get any course you like for free! Previous Previous post: work for sail!